Now...chances are that some or most of you have gone to the sea before and you've tried snorkeling/freediving. As such you'd probably be thinking to yourself by now "Yeah Right!! As if you can ever stay still long enough in one spot to compose and take a shot!!!" Tip #4. Grab onto something!! But BE CAREFUL!!!! There are many things in the marine world that can hurt you, quite a lot of them have very sharp spikes/teeth and some even have venom! On top of that coral themselves can be very sharp and will easily graze/cut you. 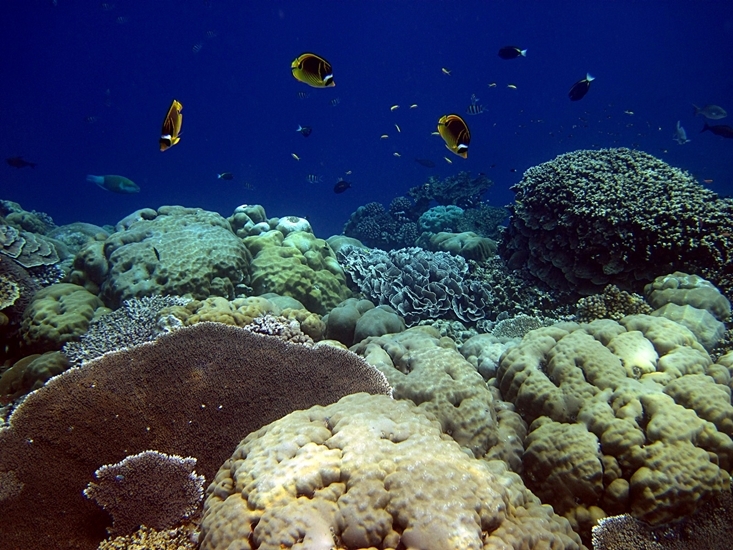 Finally, be careful not to damage the coral, they are living organisms too! By grabbing onto, say a large rock with one hand, you'll be able to stay underwater without having to constantly swim downwards. Plus with your other free hand you can be holding onto your camera and snapping away. Tip #5. Once you've reached your spot, be calm! Try your best not to be flailing your arms about, or kicking the sand up, the faster you blend into your surroundings, the faster the marine life comes back out! The shot on the left was taken at about 7m and it didn't take long for the fish to come back out once I settled near the coral at the bottom. It was really amazing to see the three brightly colored yellow fish almost dancing in synchrony! !